As can be observed, there are 11 known kistvaens in a radius of roughly 1 kilometre of Deadman’s Bottom so clearly the corpse found in the 1800s was by no means the first in the area. This phenomenon may well suggest that to early man there was something special about the valleys of the Langcombe Brook and Deadman’s Bottom. It is easier to appreciate the locations of these burial sites from an 3D aerial map as it clearly shows that the majority of these graves were situated on the valley slopes. Having described the monument as a hut circle with an annexe they then go on to observe that: ‘There is no obvious entrance‘. So in which case what is the use of a Bronze Age hut without an entrance, how would its occupants get in and out? Could this mean that the monument was not a hut circle but was used for something else? 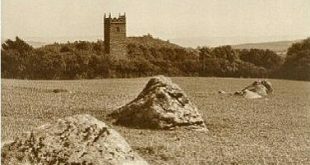 R. H. Worth and the Dartmoor Barrow Committee examined the monument in the early 1900s and discovered that the two circles were in fact paved and small amounts of charcoal we lodged in the gaps between the paving slabs. The subsoil below the paving proved to be of a light redbrick colour which suggested that some pretty fierce fires had been lit on it. The two kists were also ‘examined’ and the one nearest Deadman’s Bottom yielded up numerous fragments of decorated pot, an European Bell Beaker which was 18cm high and three barbed and tanged flint arrowheads. These finding led Worth to the conclusion that this site acted as a series of cremation pits or if you like the same as a modern day crematorium. The bodies would have been brought here and then cremated, their ashes would have then been placed in beakers and buried in the surrounding kists. Pettit, (1974, p.122) also notes that: ‘Their rather central position in the Langcombe group, and the fact that five kists are visible from them, may be of significance‘. So, there we have it, a small valley situated in a prehistoric land of the dead which may have well served as the local ‘crematorium’ for the nearby settlements. Could it be that Monument 441676 also shows evidence of some kind of change in belief and ritual? Was the fact that the cremation area was later paved over as an act of closure, the paving slabs acting as a seal over the old practices? Is there any significance that later burials were placed at the site? In later years was Deadman’s Bottom the subject of a parish boundary dispute which as the result of a fatality gave extra lands to one parish? So, many questions for such a remote and proportionally small tract of Dartmoor with equally as small number of answers. Butler, J. 1994. Dartmoor Atlas of Antiquities – Vol. III. Tiverton: Devon Books. Hemery, E. 1983. High Dartmoor. London: Hale Publishing. Pettit, P. 1974. Prehistoric Dartmoor. Newton Abbot: David and Charles.